Whether you breathed till "1" or till "Infinite" was entirely balderdash and inconsequential; what mattered above everything else on this boundless Universe; were the rays of righteously unparalleled optimism that you ignited on every step that you tread; till the time you were symbiotically alive. 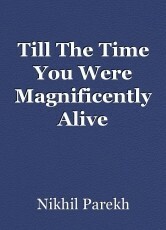 the time you were blissfully alive. the celestial instinct to live and let live that you ubiquitously preached; till the time you were unabashedly alive. were the seeds of majestically virile proliferation that you sowed; till the time you were unassailably alive. the bond of philanthropically compassionate friendship that you interminably spread; till the time you were royally alive. were the hymns of mellifluously emancipating piousness that you sing; till the time you were bounteously alive. Whether you breathed till "1" or till "Infinite" was entirely morbid and inconsequential; what mattered above everything else on this triumphant Universe; was the tirelessly augmenting empathy in your eyes for every caste; creed; fraternity of living; till the time you were vivaciously alive. were the pathways of unflinchingly fearless humanity that you pave; till the time you were redolently alive. the magic of benign togetherness that you invincibly hissed; till the time you were unconquerably alive. were those indomitably subliming smiles from your lips in good times and bad; till the time you were beautifully alive. those swords of impregnable truth that you used to assassinate the ruthlessly blasphemous devil; till the time you were jubilantly alive. Universe; were those enamoring words/symbols/drawings of immortal love that you'd so inimitably sketched; till the time you were undefeatedly alive. were those pearls of priceless enlightenment that you'd bestowed upon countless haplessly deprived; till the time you were indisputably alive. was the mirror of divine righteousness that reflected from even the most obfuscated cranny of your shadow; till the time you were fantastically alive. the foundation of fragrantly undying perseverance that you built; till the time you were handsomely alive. was that you timelessly followed the innermost tunes of your heart for the betterment of all mankind; till the time you were iridescently alive. was the innumerable orphans that you serenaded and accepted as a quintessential ingredient of your very own family; till the time you were poignantly alive.